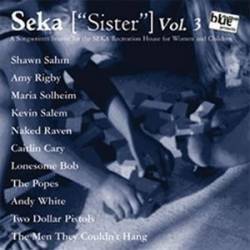 This is already the third edition of the benefit compilation supporting Seka, a house for traumatised women and children living in the war areas of former Yugoslavia on the Adriatic island Brac (Croatia). Women and children of all ethnic and religious groups can meet there during holidays in an atmosphere of respect and mutual understanding. From the first 5000 copies sold, Twah will donate 50 cents per CD to Seka and from 5000 units on the amount will be increased to 1 euro per CD. Most songs on the CD are rare or exclusive tracks, only a few have been released on band albums. As this is a Twah! release, all artists can be filed under roots rock, country or folk. Although I don't like too many songs on this CD, I respect very much the idea of supporting Seka and if you like to listen to calmer tracks for more than an hour, Seka Vol. 3 can only be recommended to you. Here's a final list of the 19 participants: Caitlin Cary (awful pop), Shawn Sahm (traditional country), Naked Raven (sleeping pill), One Bar Town (kings of trucker country), Jerry Joseph & The Jackmormons (adult rock), The Men They Couldn't Hang (folk), Mick Thomas & The Sure Thing (country), Andy White (pop), The Popes (Irish), Equation (nice pop tune), Brooklyn Cowboys and of course lots of singer songwriters (Lonesome Bob, Maria Solheim, Kevin Salem, Amy Rigby, Michael Weston King, Two Dollar Pistols, Danny Barnes, Tom Freund).